From left, defendants Anthony L. Roberts Jr., Ahmad M. Rayton and Dominique J. McMillon sit during a joint preliminary hearing, Thursday, Jan. 11, 2018, for charges related to a October 2017 triple homicide on Massachusetts Street. In the middle of the voir dire process while the lead defendant’s attorney was questioning potential jurors, a judge declared a mistrial and called off the downtown Lawrence triple murder trial on Thursday. The high-profile trial started Monday with jury selection, and had been scheduled to last two weeks. 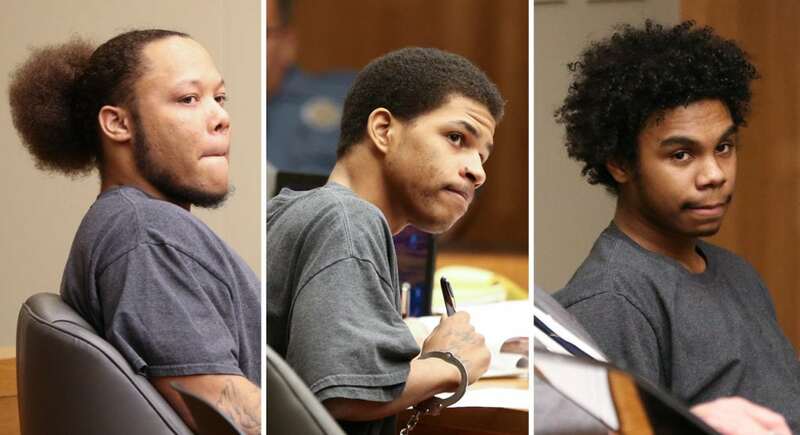 Three Topeka men charged with murder and other crimes from the October 1, 2017, quintuple shooting on Massachusetts Street were to face a jury as a group, each with his own lawyer. However, the trial never got that far; a jury was never selected. Around 3:15 p.m. Thursday, almost four full days into the jury selection process, Douglas County District Court Judge Sally Pokorny told the courtroom that, because of a legal matter — which she did not explain — she was declaring a mistrial and everyone could go home. Roughly 90 remaining potential jurors flowed out of the courtroom and left. Several questioned by the Journal-World said they didn’t know what prompted the mistrial. Pokorny, through her office staff, declined to offer specifics following the potential jurors’ dismissal. District Attorney Charles Branson also declined to comment on his way out of the courtroom, as did all three defendants’ attorneys. The defendants and attorneys will return to court Friday morning to discuss the next steps, likely rescheduling the trial or even splitting up the defendants for separate trials. 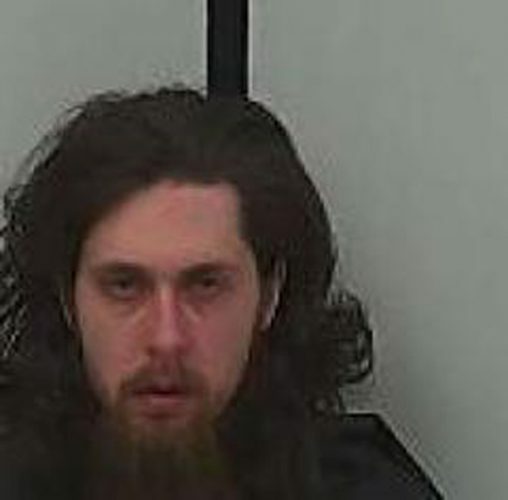 Pokorny said in the courtroom that her initial thought was to try defendant Anthony L. Roberts Jr., 21, who is charged with all three murders and one attempted murder, separately from his two co-defendants. It was Roberts’ attorney, Topeka-based Jennifer Chaffee, who was at the front of the room questioning potential jurors just before Pokorny declared the mistrial. Chaffee was the second of three defense attorneys to have their turns leading voir dire, the questioning process. Branson raised objections — which the judge sustained — to several of Chaffee’s questions, including on the topics of how Kansas law defines self-defense, what charges her client was facing and how long his sentence could be if convicted, one potential juror told the Journal-World. Shanna Shafer said she did not know what caused the mistrial but that Chaffee seemed “flustered,” and the potential jurors weren’t responding well to her. After one objection by Branson, the attorneys conferred with the judge at the bench, and then the conversation moved into the judge’s chambers, Shafer said. She said after about 20 minutes, the judge and attorneys returned and Pokorny announced the mistrial. Roberts’ co-defendants facing lesser charges are 23-year-old Ahmad M. Rayton, represented by appointed attorney Michael Clarke, and 20-year-old Dominique J. McMillon, represented by appointed attorney J.C. Gilroy. Both Clarke and Gilroy previously raised concerns about their clients getting a fair trial, and pointed to Chaffee as the reason. The final pretrial hearing, late last week, was tense. Chaffee had filed a motion to disqualify Branson and Chief Assistant District Attorney David Melton from the case. While arguing her point in court, she accused the DAs of “bullying” her, committing prosecutorial misconduct and losing “all sight of justice.” Branson refuted her claims, saying Chaffee was the one misrepresenting things to the court and unnecessarily taking legal matters personally. At that hearing, in a late-hour attempt to get the defendants split up for their trials, Gilroy seconded Clarke when Clarke said he feared jurors would view the three clients and lawyers as a “defense team” instead of considering them — and their courtroom styles — separately. The judge did not disqualify the DAs, nor did she agree to sever the trial at that time. Already this week’s jury selection process had been of unprecedented length and magnitude, at least for Douglas County District Court. Roughly 200 potential jurors had been called to ensure there would be enough people to pick from to get a jury of 12, plus four alternates, for the case. It carried high-stakes criminal charges: three murders and multiple attempted murders. It was high-profile, having occurred in a big crowd in the middle of Lawrence’s beloved entertainment district. And it was high-complexity, with thousands of pages of investigatory files, hours of video evidence and hundreds of tips to police. 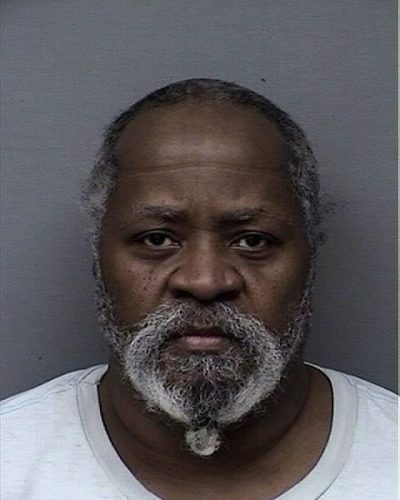 According to pretrial filings, at least 85 people — including nearly three dozen from the Lawrence Police Department alone — were subpoenaed for the trial. One of the defendants, McMillon, has now been in jail potentially longer than he would be imprisoned if convicted of all his charges. Late Thursday, with the trial decidedly delayed, McMillon’s attorney asked for a personal-recognizance bond. Prosecutors opposed that, citing the nature and severity of the case at hand, but said that if he were released, they wanted him to stay out of Lawrence. Pokorny didn’t rule on McMillon’s bond, saying she would do so Friday.